I'm Mrs. P and I'm all about student engagement! I'm not satisfied with my students merely memorizing facts for a test and promptly forgetting everything they learned. No- students need to "learn by doing" and this imperialism culminating unit project achieves just that. Watch your students get excited as they explore the imperialist relationship between two countries more in depth. Observe them make deep connections between imperialism and its effect on developing nations. Allow your students to become the experts, curate their own museum exhibit, and practice their presentation skills in a non-digital format. 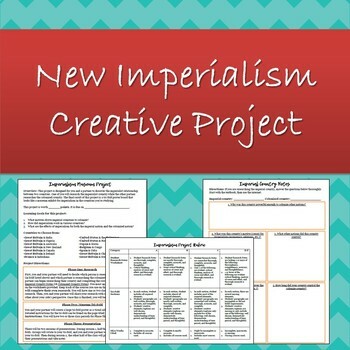 This project will engage your students as they research the causes and effects of imperialism in the country of their choice. Each student will have one partner. Each partner will focus on researching either the imperial country or the colonized country. Using guided research notes, students will become the expert in their topic, share their findings with their partner, and then create a tri-fold museum display that incorporates their findings, writing skills, critical thinking, and creativity. At the end of the project, students will rotate to different tri-fold museums and learn about one another's projects in a final presentation. The entire project lasts at least two weeks. Your students will need an introduction to the time period and imperialism before beginning this project. This project is best used as the culminating assessment for the unit or even as a primary method for teaching the major topics in a project-based classroom. I personally use this project in my 10th grade World History course to teach the major topics of New Imperialism.